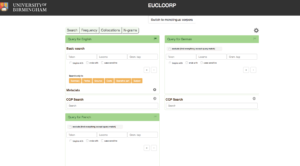 The Homepage of the EUCLCORP application is set to a multilingual corpora search with options to search in the English, French or German corpora. Metadata options include case name, case number and date. 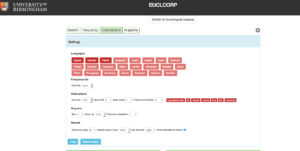 Clicking takes you to the settings page, where all of the search options can be customised. 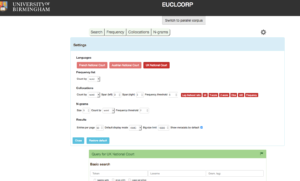 The case law corpora in 23 official EU languages* can be searched, and there are various options regarding frequency, collocation, N-grams and results. 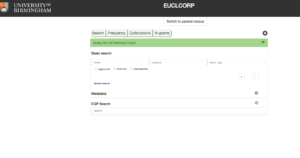 Clicking again takes you back to the search page and from there you can switch to the monolingual corpora. The default monolingual corpus is case law from the UK Supreme Court. Once again, clicking takes you to the settings page, where you can specify the monolingual corpus in which to search and customise the various search options. *all EU official languages are represented, with the exception of Irish. Due to the ‘Irish Derogation’ [Council Regulation (EC) No 920/2005 of 13 June 2005 (OJ L 156, 18.6.2005, p. 3), as extended by Council Regulation (EU, Euratom) 2015/2264 (OJ L 322, 8.12.2015, p. 1)] the Court of Justice of the European Union is not currently required to provide translations of its case law into Irish. As a result, there is, at this point in time, simply not enough data to create an Irish language section of the EUCLCORP.